Lush Fab Glam Inspired Lifestyle For The Modern Woman: Eye On Technology: The iPhone 5 Release. Eye On Technology: The iPhone 5 Release. As the launch date for the new iPhone gets closer, the value of old iPhones is depreciating rather quickly. To help consumers get the best value, Gazelle, the nation’s leading consumer electronics trade-in site, announced the extension of its industry-leading 30-day price lock guarantee. Current pricing for the iPhone 5 ranges between $125 for a broken phone and to $350 for a phone in flawless condition. 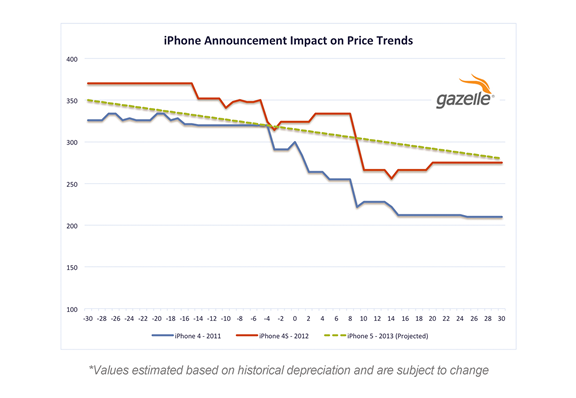 Visit Gazelle today, and see what your iPhone is worth! This post brought to you by Gazelle.